Internationally known intuitives reveal the secrets to living a rewarding life. Discover answers to life’s questions. Access your intuition and higher wisdom. Get unstuck and move ahead on your path. This valuable guidebook shows you how you can create all that you desire. These inspired conversations with the universal wisdom of All That Is will move you. Anne Salisbury, PhD, ThD, MA, MBA is a clairvoyant seer who helps clients find answers to those important questions in life. She is the Founder of the Transpersonal Hypnotherapy Institute, Inc. and the author of Eureka! Understanding and Using the Power of Your Intuition. Greg Meyerhoff is an energy healer who breaks through the roadblocks in his clients’ energy systems so they can experience success with ease. He, along with Anne, is the Co-Founder of Go Intuition, Inc., a consulting group that provides business consulting and intuitive counseling. Visit GoIntuition.com. The Path has received multiple awards and is an Amazon best-seller in its category! Order your book signed by the authors from this website. 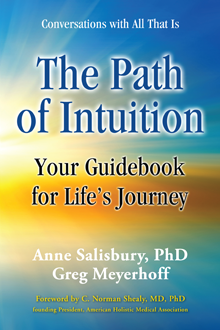 Order The Path of Intuition from Amazon.com in book or ebook format.